정해진 전문가로부터 DAX를 만들고 작업하는 방법을 살펴봅니다.Learn how to create and work with DAX, from an established expert. DAX를 소개하기 위해 설계된 Power BI 단계별 학습 섹션을 시작합니다.Welcome to the Power BI Guided Learning section designed to introduce you to DAX. DAX는 데이터 분석 식의 약자로 Power BI 전체에서 사용되는 수식 언어입니다(Power BI 숨은 기능에서도 사용함).DAX stands for Data Analysis Expressions, and it is the formula language used throughout Power BI (it is also used by Power BI behind the scenes). 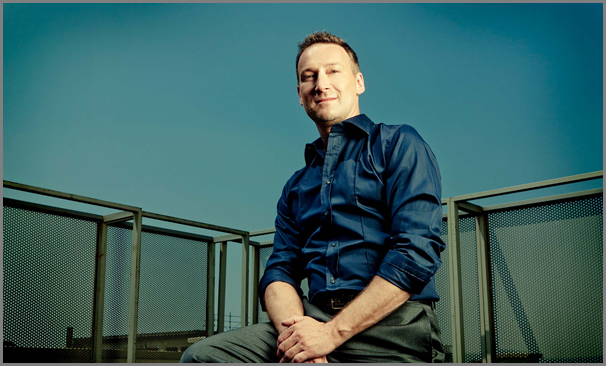 또한 DAX는 Powerpivot과 SSAS 테이블 형식과 같은 Microsoft의 다른 제품에도 있지만 단계별 학습의 이 컬렉션은 DAX를 사용하는 방법 및 Power BI에서 사용자가 사용할 수 있는 방법에 중점을 둡니다.DAX is also found in other offerings from Microsoft, such as Power Pivot and SSAS Tabular, but this collection of Guided Learning topics focuses on how DAX is used - and can be used by you - in Power BI. 이 단계별 학습 섹션의 목표는 유명한 DAX 전문가인 Alberto Ferrari가 설명한(그리고 경험으로 학습한) DAX에 대해 인지하는 방법, 작동 방법 및 가장 유용한 기능과 같은 DAX 기본 사항 및 기본 항목을 알려주는 것입니다.The goal of this Guided Learning section is to teach you DAX basics and fundamentals - how to think about DAX, how it works, and the most useful features as explained (and learned with lots of experience) by a renowned DAX expert, Alberto Ferrari. DAX에 대한 이 단계별 학습 섹션의 비디오는 DAX 수식 언어의 작동 원리의 관점에서 DAX 기본 사항을 설명합니다.The videos in this Guided Learning section on DAX teaches you DAX basics from the perspective of how the DAX formula language works. DAX 수식을 처음부터 만들 경우에 유용하지만 쿼리 편집기에서 쿼리를 만드는 것처럼 Power BI에서 DAX 수식을 생성하는 방법을 이해하는 데에도 매우 유용합니다.This is useful when creating DAX formulas from scratch, but it's also very useful for understanding how Power BI creates those DAX formulas as you create queries in the Query Editor. DAX 개념은 쉽고 간단하지만 DAX는 강력합니다.DAX concepts are simple and straightforward, but DAX is powerful. DAX는 완벽하게 사용하고 이해하기 어려울 수 있는 몇 가지 고유한 프로그래밍 개념 및 패턴을 사용합니다.DAX uses some unique programming concepts and patterns which can make it difficult to fully use and understand. 언어를 배우는 전통적인 방법은 DAX에 대한 가장 좋은 방법이 아닐 수 있으므로 이 비디오의 목표는 나중에 Power BI 작업에서 도움을 줄 개념과 이론을 알려 주는 것입니다.Traditional ways of learning languages may not be the best approach to DAX, so the goal of this video is to teach you concepts and theory that will help later on in your Power BI work. DAX는 기능 언어입니다. 즉, 실행되는 전체 코드가 함수 내에 포함됩니다.DAX is a functional language, which means the full executed code is contained inside a function. DAX에서 함수는 다른 중첩된 함수, 조건문 및 값 참조를 포함할 수 있습니다.In DAX, functions can contain other, nested functions, conditional statements, and value references. DAX의 실행은 가장 안쪽 함수 또는 매개 변수부터 시작해서 바깥쪽으로 작동합니다.Execution in DAX starts from the innermost function or parameter, and works outward. Power BI에서 DAX 수식은 한 줄에 기록되므로 함수를 올바르게 서식 지정하는 것이 가독성을 위해 중요합니다.In Power BI, DAX formulas are written in a single line, so formatting your functions correctly is important for readability. DAX는 테이블과 함께 사용하도록 설계되었으므로 숫자 및 기타의 두 가지 기본 데이터 형식만을 가집니다.DAX is designed to work with tables, so it has just two primary data types: Numeric and Other. 숫자는 정수, 10진수 및 통화를 포함할 수 있습니다.Numeric can include integers, decimals, and currency. 기타는 문자열 및 이진 개체를 포함할 수 있습니다.Other can include strings and binary objects. 즉 DAX 함수를 한 가지 형식의 숫자에서 작동하도록 작성하는 경우 다른 숫자 데이터에서 작동한다는 것을 확신할 수 있습니다.This means that if you build your DAX function to work on one type of number, you can be assured that it will work on any other Numeric data. DAX는 연산자 오버로드를 사용합니다. 즉 계산에서 데이터 형식을 섞을 수 있으며 결과는 입력에 사용되는 데이터의 형식에 따라 변경됩니다.DAX uses operator overloading, which means that you can mix data types in your calculations and the results will change based on the type of data used in the inputs. 변환이 자동으로 발생합니다.Conversion happens automatically. 즉, Power BI에서 사용되는 열의 데이터 형식을 알 필요가 없지만 경우에 따라 변환이 예기치 못한 방식으로 발생할 수 있음을 의미하기도 합니다.This means you don't have to know the data types of the columns you're working with in Power BI, but it also means that sometimes conversion can happen in unexpected ways. 연산자가 예상한 대로 동작하는지 확인하기 위해 사용 중인 데이터를 이해하는 것이 좋습니다.It's good practice to understand the data you are using to ensure that your operators are behaving as anticipated. 특히 Power BI에서 함께 많이 작업할 가능성이 있는 하나의 데이터 형식은 날짜/시간입니다.There is one data type in particular that you'll likely be working with a lot in Power BI: DateTime. 날짜/시간은 정수와 소수 부분을 모두 사용하여 부동 소수점 값으로 저장됩니다.DateTime is stored as a floating point value with both integer and decimal parts. 날짜/시간을 1900년 3월 1일 이후의 모든 시간 간격을 계산하기 위해 정확하게 사용할 수 있습니다.DateTime can be used accurately for calculations of any time period after March 1, 1900. 그 중 하나를 만드는 방법을 살펴보기 전에 계산 된 열 또는 계산 된 측정값 중 하나를 만들 때 사용하는 테이블 및 열에 대한 DAX 구문을 파악하는 것이 좋습니다.Before digging into creating either of those, it's good to have a firm grasp on DAX syntax for tables and columns, which you will use when creating either calculated columns or calculated measures. 테이블 이름을 완전히 생략하거나 열 이름만 사용할 수 있지만 이는 지우기 기능을 작성하는 데 적절하지 않습니다(따라서 DAX 코드 지우기의 경우에도 해당).You can also omit the table name completely and just use the column name, but this is poor practice for writing clear functions (and thus, for clear DAX code). 열 이름은 항상 대괄호를 포함해야 합니다.Column names must always include the square brackets. 값을 조각화하거나 필터링하려는 경우 또는 테이블의 모든 행을 계산하려는 경우 계산 열이 유용합니다.Calculated columns are useful when you want to slice or filter on the value, or if you want a calculation for every row in your table. 모델링 탭에서 새 열을 선택하여 Power BI Desktop에서 계산 열을 만들 수 있습니다. 만든 새 열을 볼 수 있고 수식 입력줄이 채워지며 DAX 수식에 대해 준비가 완료되었기 때문에 데이터 보기가 좋습니다(보고서 또는 관계 보기 대신).You can create calculated columns in Power BI Desktop by selecting New Column from the Modeling tab. 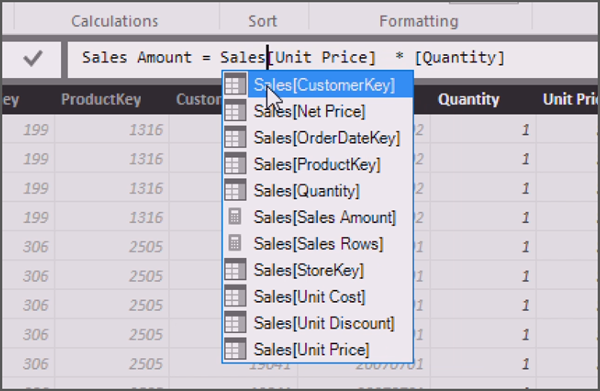 It's best to be in Data view (rather than Report or Relationships view), since you can see the new column created and the Formula Bar is populated and ready for your DAX formula. 새 열 단추를 선택하면 수식 입력줄은 기본 열 이름으로 채워지고(물론 수식에 맞게 변경) = 연산자 및 새 열이 다음 이미지에 보이는 대로 데이터 표에 나타납니다.Once you select the New Column button, the Formula Bar is populated with a basic column name (which you change to suit your formula, of course) and the = operator, and the new column appears in the data grid, as shown in the following image. 계산 열 수식에서 테이블 또는 열을 참조하는 경우 테이블에서 행을 지정하지 않아도 됩니다. 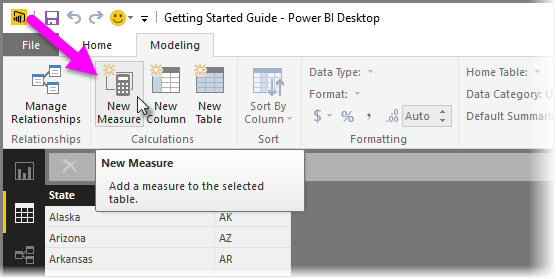 Power BI에서 각 계산에 대한 현재 행의 열을 계산합니다.If you reference a table or column in your calculated column formula, you do not need to specify a row in the table - Power BI calculates the column for the current row for each calculation. 백분율 또는 비율을 계산하거나 복잡한 집계가 필요할 때 계산 측정값을 사용합니다.Use a calculated measure when you are calculating percentages or ratios, or you need complex aggregations. DAX 수식을 사용하여 측정값을 만들려면 모델링 탭에서 새 측정값 단추를 선택합니다. 수식 입력줄을 보여 주고 쉽게 DAX 수식을 작성할 수 있기 때문에 Power BI Desktop에서 데이터 보기가 좋습니다.To create a measure using a DAX formula, select the New Measure button from the Modeling tab. 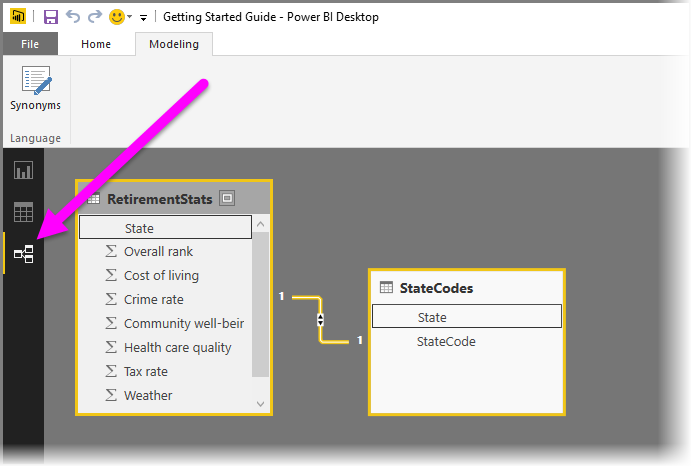 Again, it's best to be in the Data view of Power BI Desktop since it shows the Formula Bar and makes it easy to write your DAX formula. 측정값을 사용하면 새 측정값 아이콘이 측정값의 이름을 가진 필드 창에 표시됩니다.With measures, you see a new measure icon appear in the Fields pane with the name of the measure. 수식 입력줄은 DAX 수식의 이름으로 다시 채워집니다(이 경우 측정값으로 채워짐).The Formula Bar is again populated with the name of your DAX formula (this time, with your measure). Excel과 유사하게 Power BI Desktop 수식 입력줄에 수식을 입력하기 시작할 때 사용할 수 있는 함수 중 어떤 것을 선택할지 결정할 수 있도록 사용 가능한 함수의 목록을 표시합니다.Similar to Excel, when you start typing your formula into the Power BI Desktop Formula Bar, a list of available functions appears to help you determine which available function you want to select. 키보드의 위 및 아래 화살표 키를 사용하여 사용 가능한 함수를 강조 표시할 수 있고 간략한 설명이 표시됩니다.And by using the up and down arrow keys on your keyboard, you can highlight any of the available functions, and a brief description is displayed. Power BI에서는 지금까지 입력한 문자와 일치하는 함수를 표시하므로 S를 입력하면 S로 시작하는 함수만 목록에 나타납니다.Power BI displays the functions that match the letters you've typed so far, so if you type S only functions that begin with S appear in the list. Su를 입력하는 경우 해당 이름에 문자 시퀀스 Su를 포함하는 함수만이 목록에 표시됩니다(Su로 시작하지 않아도 해당 문자 시퀀스를 포함하기만 하면 됨).If you type Su, only functions that contain the letter sequence Su in their name appear in the list (they don't have to start with Su, they just have to contain that letter sequence). 이러한 방식으로 쉽게 DAX를 실험하고 Power BI에서 사용할 수 있는 다양한 DAX 함수 각각을 찾을 수 있습니다.It's easy to experiment with DAX in this way, and to find each of the various DAX functions that are available in Power BI. 입력하기 시작하면 Power BI에서 함께 도움을 줍니다.All you have to do is start typing, and Power BI helps you along. 시작된 DAX 수식을 가져오는 방법을 알았으므로 이러한 각 함수 범주를 차례로 살펴보겠습니다.Now that we know how to get that DAX formula started, let's take a look at each of these function categories in turn. 이러한 함수는 숫자 열에서만 작동하며 일반적으로 한 번에 하나의 열만 집계할 수 합니다.These functions work only on numeric columns, and generally can aggregate only one column at a time. 그러나 SUMX처럼 X로 끝나는 특별한 집계 함수는 여러 열에서 작동할 수 있습니다.However, special aggregation functions that end in X, such as SUMX, can work on multiple columns. 이러한 함수는 테이블에서 반복되며 각 행에 대해 식을 평가합니다.These functions iterate through the table, and evaluate the expression for each row. 이러한 함수는 고유 값, 비어 있지 않은 값, 테이블 행 등 여러 요소의 개수를 계산합니다.These functions count different elements, such as distinct values, non-empty values, and table rows. 이러한 특수 함수는 연산자를 사용하여 표현될 수도 있습니다.These special functions can also be expressed with operators. 예를 들어 AND은 DAX 수식에서 &&(로 바뀜)로 입력될 수 있습니다.For example, AND can be typed as (replaced with) && in your DAX formula. DAX 코드의 가독성을 위해 수식에 둘 이상의 조건이 필요하지만 그렇지 않으면 함수 이름 자체를 사용하는 모범 사례인 연산자(예: &&)를 사용할 수 있습니다(예: AND).You can use operators (such as &&) when you need more than two conditions in your formula, but otherwise, it's best practice use the function name itself (such as AND) for readability of your DAX code. 이러한 함수는 상황에 맞게 유용할 수 있는 반면 데이터 형식을 제공하는 이러한 함수에 의존하지 않고 시간에 앞서 열의 데이터 형식을 알 수 있는 값이 있습니다.While these functions can be situationally useful, there is value in knowing the data type of your columns ahead of time, rather than depending on these functions to provide the data type. DAX에서는 MAX 및 MIN 함수를 사용하여 값을 집계하고 비교합니다.DAX uses the MAX and MIN functions to both aggregate values, and to compare values. 이러한 텍스트는 동일한 이름을 갖는 Excel 함수와 매우 유사하게 작동하므로 따라서 Excel이 텍스트 기능을 처리하는 방법에 대해 잘 알고 있다면 이미 한 발 앞서 있는 것입니다.These text work very similarly to the Excel functions that have the same name, so if you're familiar with how Excel handles text functions, you're already a step ahead. 그렇지 않으면 항상 Power BI에서 이러한 함수를 실험하고 어떻게 동작하는지에 대해 자세히 알아볼 수 있습니다.If not, you can always experiment with these functions in Power BI, and learn more about how they behave. 이러한 함수는 날짜 값에서 정보를 추출하고 계산하는 데 유용하지만 날짜 테이블을 사용하는 시간 인텔리전스에 적용되지 않습니다.While these functions are useful to calculate and extract information from date values, they do not apply to time intelligence, which uses a date table. 변수를 사용하는 작업은 DAX 식의 매우 강력한 요소입니다.Using variables are an extremely powerful part of a DAX expression. 변수는 전체 테이블을 포함하여 모든 데이터 형식일 수 있습니다.Variables can be any data type, including entire tables. DAX 식에서 변수를 참조할 때마다 Power BI는 사용자의 정의에 따라 해당 값을 다시 계산해야 합니다.Keep in mind that each time you reference a variable in your DAX expression, Power BI must recalculate its value according to your definition. 따라서 함수에서 변수를 반복하지 않는 것이 좋습니다.For this reason, it's good practice to avoid repeating variables in your function. Power BI를 통해 완전히 다른 데이터 원본에서 제공하는 테이블을 비롯하여 여러 테이블 간에 관계를 만들 수 있습니다.Power BI lets you create relationships among multiple tables, including tables that come from completely different data sources. Power BI Desktop의 관계 보기에서 모든 데이터 모델에 대한 이러한 관계를 볼 수 있습니다.You can see those relationships for any data model in the Relationships view of Power BI Desktop. DAX에는 설정된 관계가 있는 테이블과 상호 작용할 수 있도록 해주는 관계형 함수가 있습니다.DAX has relational functions that enable you to interact with tables that have established relationships. DAX 함수를 사용하여 열의 값을 반환하거나 관계의 모든 행을 반환할 수 있습니다.You can return the value of a column, or you can return all rows in a relationship using DAX functions. 예를 들어 RELATED 함수는 관계를 따르고 열 값을 반환하는 반면, RELATEDTABLE은 관계를 따르고 관계된 행만을 포함하도록 필터링된 모든 테이블을 반환합니다.For example, the RELATED function follows relationships and returns the value of a column, while RELATEDTABLE follows relationships, and returns an entire table that is filtered to include only related rows. RELATED 함수는 다대일 관계에서 작동하는 반면, RELATEDTABLE은 일대일 관계에서 작동합니다.The RELATED function works on many-to-one relationships, while RELATEDTABLE is for one-to-many relationships. 관계형 함수를 사용하여 여러 테이블의 값을 포함하는 식을 작성할 수 있습니다.You can use relational functions to build expressions that include values across multiple tables. DAX는 관계의 체인 길이에 상관없이 이러한 함수를 사용하여 결과를 반환합니다.DAX will return a result with these functions, regardless of the length of the chain of the relationship. DAX 및 Excel 수식 언어 간의 중요한 차이점은 DAX를 사용하여 단일 값으로 제한되는 것이 아니라 식 사이에 전체 테이블을 전달할 수 있다는 점입니다.One significant difference between DAX and the Excel formula language is that DAX allows you to pass entire tables between expressions, rather than being constrained to a single value. DAX를 사용하는 경우 한 가지 강력한 효과는 해당 식에서 테이블을 필터링한 다음 필터링된 일련의 값으로 작업할 수 있다는 점입니다.One powerful effect is that DAX allows you to filter tables in its expressions, then work with the filtered set of values. DAX를 사용하면 완전히 새로운 계산 테이블을 만들 수 있으며 데이터 모델에서 해당 테이블과 다른 테이블 간의 관계를 만드는 것을 포함하여 다른 테이블처럼 다룰 수 있습니다.With DAX, you can create entirely new calculated tables and then treat them like any other table - including creating relationships between them and other tables in your data model. 이러한 함수는 값이 아닌 전체 테이블을 반환합니다.These functions return a full table rather than a value. 일반적으로 최종 값을 반환한 테이블을 사용하지 않고 추가 분석에서 테이블 함수의 결과를 더 규모가 큰 식의 일부로 사용할 수 있습니다.Typically you'll use the results of a table function in further analysis as part of a greater expression, rather than using that returned table a final value. 테이블 함수를 사용하는 경우 결과는 해당 열 관계를 상속해야 합니다.It's important to note that When you use a table function, the results inherit the relationships of their columns. 해당 식은 현재 필터 내용을 무시하고 전체 테이블을 필터링합니다.That expression would put a filter over the entirety of Table, ignoring any current filter content. DISTINCT 함수는 현재 컨텍스트에서도 볼 수 있는 열의 고유 값을 반환합니다.The DISTINCT function returns the distinct values of a column that are also visible in the current context. 따라서 위의 DAX 식 예제를 사용하기 위해 해당 식에서 ALL을 사용하면 필터를 무시하는 반면 ALL을 DISTINCT로 대체하면 관찰합니다.So to use the above DAX expression example, using ALL in that expression ignores filters, while replacing ALL with DISTINCT would observe them. 이 열에 있는 값의 개수는 몇 개인가요?How many values do I have for this column? 이는 사용자 앞에 표시된 테이블을 통해 답변할 수 있는 간단한 질문일 수 있지만 DAX에서는 특히 테이블 간에 관계가 있는 경우 다른 방식으로 접근합니다.That may be a simple question to answer with a table displayed in front of you, but DAX approaches in a different way in a different way, particularly when there's a relationship between tables. 예를 들어 Power BI와 DAX는 제대로 교차 인덱싱되지 않은 값을 포함합니다.For example, Power BI and DAX includes values that are not properly cross-indexed. 들어오는 관계가 중단된 경우 DAX는 모든 필드에서 공백이 있는 관련 테이블에 새 행을 추가하고 해당하는 새 행을 인덱싱되지 않은 행에 연결하여 참조 무결성을 보장합니다.If the incoming relationship is broken, DAX adds a new row to the related table that has blanks in every field, and links that new row to the unindexed row to guarantee referential integrity. ALL을 사용하는 경우처럼 함수에 빈 행이 포함되면 해당하는 비어 있는 행은 해당 열에 반환된 값의 개수에 포함됩니다.If your function includes blank rows, such as is often the case when using ALL, those blank rows will then be included in the number of values returned for that column. DAX 함수를 사용하여 전체 계산 테이블을 만들 수도 있습니다.You can also create entire calculated tables using DAX functions. DAX를 사용하여 만든 계산 테이블에는 NAME 및 TABLE 함수가 필요합니다.Calculated tables created using DAX require a NAME and a TABLE function. 계산 테이블은 관계를 설정하는 등 다른 테이블처럼 사용할 수 있습니다.Calculated tables can be used like any other table, including establishing relationships. Power BI에 대한 단계별 학습 과정의 DAX 소개 단원을 마쳤습니다.You've completed the Introduction to DAX section of Power BI Guided Learning. 대단한 여정이었죠!What a journey! 이러한 자습서를 차례대로 마치셨다면 단계별 학습 과정의 모든 단원을 완료하신 것입니다.If you've done these tutorials in sequence, then you've finished all the sections of Guided Learning. 수고하셨습니다!Way to go! 이제 Power BI를 사용하여 여러분의 스토리를 알리는 멋진 보고서와 대시보드를 만들어 보세요.Now go use Power BI to create compelling reports and dashboards that tell your story.